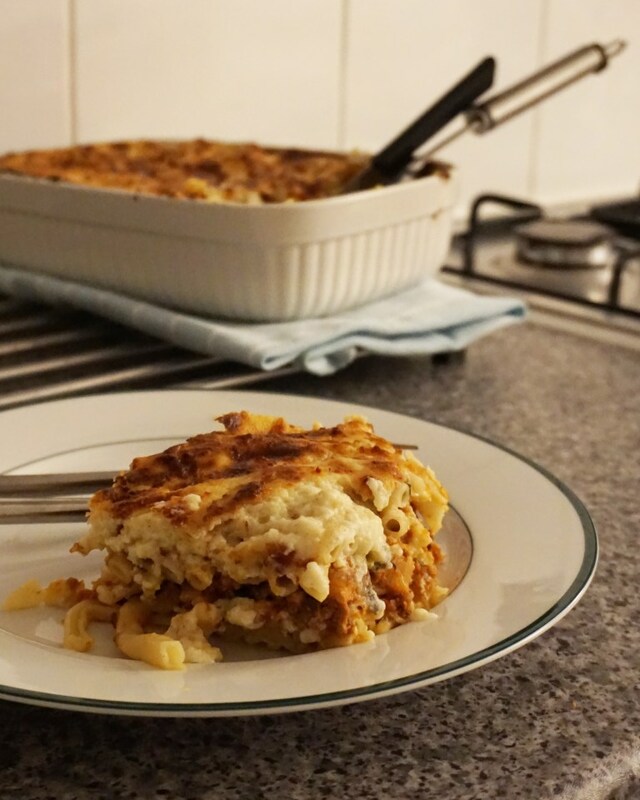 Pastitsio is a classic Greek comfort food. It is like a lasagna, where it involves layering up some pasta, meat ragu, bechamel sauce, and baked till golden. 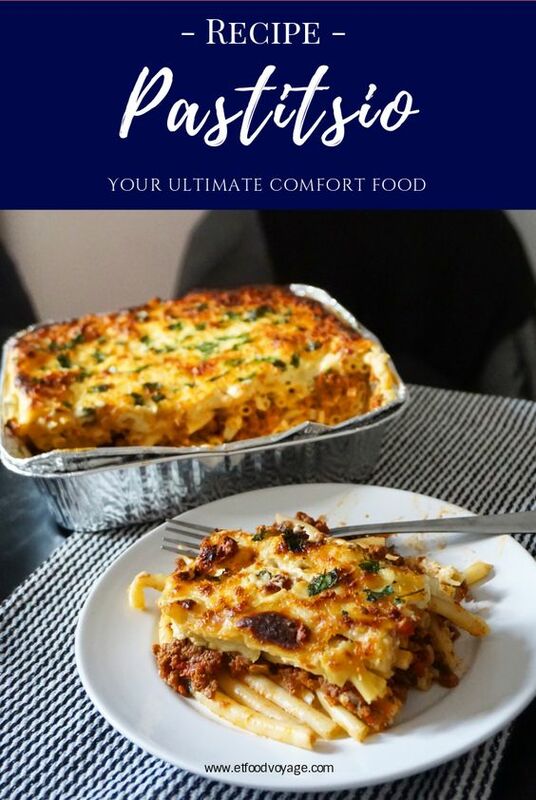 Nevertheless, Pastitsio is distinctly different from lasagna – especially on the type of pasta used. In Pastitsio, you use this specific type of pasta called Greek Macaroni Pastitsio Noodles. It is long like spaghetti but shaped like a tube. I’m not sure where exactly you can find it in London but a friend of mine found it at a local Greek supermarket in far North London. It’s more of a typical home dish rather than restaurant dish. A very close relative of this dish is Moussaka, which is very popular in restaurants. Heat 1-2 tablespoons of oil in a large pan. Sweat Onions until softened and turn golden in colour. Add in Garlic and a pinch of Chilli Flakes (if using) and cook for another two minutes or so until fragrant. Briefly season with salt and pepper, and stir in the mince. Brown the mince and add in oregano, bay leaf. Stir in tomato paste and add a pinch of cinnamon. Briefly stir until evenly coated. Then add in the chopped tomatoes and beef stock. Simmer for about 45 minutes, stirring occasionally until reduced. Stir in the parsley. Discard bay leaves and set aside. In a saucepan, melt the butter and add in the flour to make a roux. Pour in a cup of milk and stir until smooth. Repeat with second cup of milk. Season with pepper, nutmeg and cinnamon. Add in the remaining milk and whisk until it starts to thicken up. Whisk in half of the grated halloumi cheese. Blend until it attains a thick consistency. Remove from heat and stir in egg yolk. Set aside. Boil a pot of salted water and cook the Pastitsio pasta according to package instructions. Strain. Layer Pastitsio pasta at the bottom of the baking tray. Brush with egg whites. Sprinkle a third of grated halloumi cheese. Pour in the meat mixture on top. Add another layer of pasta and top with grated halloumi cheese. Pour in the Bechamel sauce and top with more grated halloumi cheese. Bake for 45 minutes until bubbling and golden in colour. Let cool for 5-10 minutes before serving. 0 Response to "Making Cypriot Pastitsio"